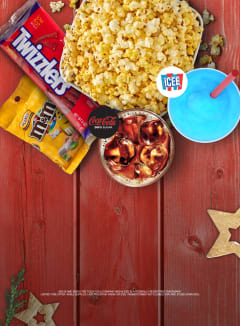 Get a Regular popcorn, two Regular fountain drinks or ICEEs and two candies for just $24! Upgrade to Large popcorn and drinks for just $2 more and share your Snacker Pack with the whole family. ©2018 AMC ©2018 The Coca-Cola Company ©2018 ICEE is a federally registered trademark. Promo combo not eligible for AMC Stubs upgrade.